Congratulations to Nick and the lads from Watch the Bluebirds Fly Fanzine - 20 years and still going, the current issue (No. 65) is a return to form for the Abercynon based publication. Now available on the terraces at Ninian Park. 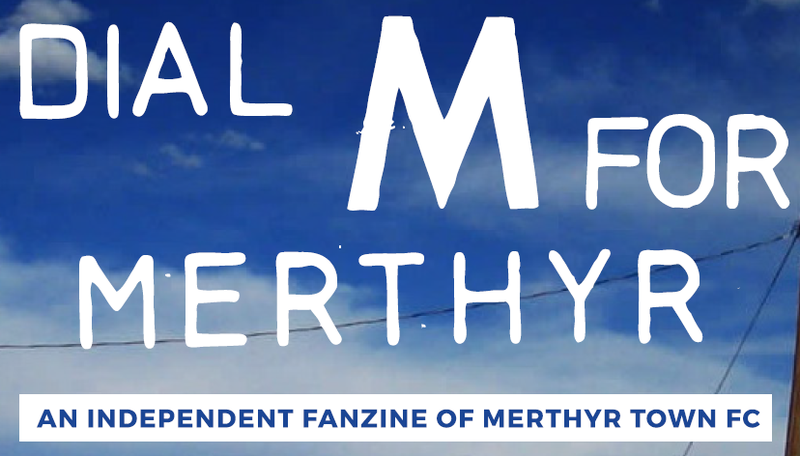 Thanks to everyone who bought a fanzine today, it was great to see that Dial M For Merthyr remains a favourite amongst the supporters. So far we have raised £58.50 through the first day of sales, this profit will go towards the Players Travel Fund. On that subject, don't forget that the Trust is hosting a Quiz at the Cefn Club on Thursday 19th March starting at 7.30pm. All profits from this event will also go into the Players Travel Fund. Staggering news - we said there would be no more Dial Ms in print, but as usual we couldn't resist once more day in the sun. Issue 47 goes on sale outside Penydarren Park before tomorrow's Merthyr game versus Brackley. Price 50p. Dial M's Jon Owen stars as Dixie in the second episode of Svengali. Keep an eye out for Guardy who makes his acting debut. His texting in the pub scene is remeniscent of a young Al Pacino. Big things are expected of Guardy in the future. And I knew I would just die if I didn't spend the rest of my life with you.